I was reading a book this morning and the author mentioned someone with the nickname "Sparky". Then somehting hit me and I stopped reading right there! I used to be called "Sparky" by a few, but it's been long forgotten. I'm not sure now who started it, but a few friends picked up on it. It characterized my attitude I think. I'm not sure it was a good thing. It would have meant having a short fuse, snapping easily, etc. I hope this isn't as noticeable of my life anymore, but I know those tendencies still lurk beneath the surface. To be "sparky" doesn't have to be bad though. If I use this characteristic differently, it could have a dramatic impact on the people around me. It's a positive sparky attitude! A few months ago, I began working with a mentor to discover the difference I was to make with my life. After what seemed to be a grueling hour, the answer I came up with left me saying "But that's only the starting point!" It kind of frustrated me. In a way, my answer, my difference, seemed insignificant, but I realized that it was only with that in place that everything else could follow. As I was thinking about this today, I recalled an incident last year when I was walking to work and thinking about this same thing. A single word comes to mind from my thought processes that morning. Catalyst. One of the definitions Dictionary.com provides for this word is "a person or thing that precipitates an event or change." Or in chemistry, it's the substance that causes or accelerates a reaction. In a sense, the impact I make on other people's lives is only meant to be a catalyst. But it's that catalyst, that "spark" if you will, that causes everything else to happen. 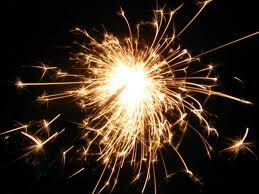 I want my life to ignite a spark in the lives of others. In order to do that, I must first ignite the spark in my own. I have to be willing to step out, think big, embrace change, take risks and refuse to quit unless God makes it clear something is not His will. If I want to show others there's more to be had in life, if I want them to strive after greater things, I must first show them with my life. My life is not at all glamorous by the common standard, but people have been looking at my life recently and asking "How....?" That's what I should be hearing. I'm still asking myself that question! There's a great story to it. But there would be no story if I chose to shrink back and play it safe. If I played it safe, that spark likely wouldn't ignite. What kind of impact do you wish to have in the lives around you? What kind of changes do you want to see? Is your life demonstrating it? Do you cause a desire in others for that change? You must first ignite the spark in your own life. Only then can you spread the flame.